With the Storm Wardens project drawing to a close (Sunday July 18th at 7pm PST, which means you can donate up until 10pm on Sunday here on FTW), I figured I would go through all my pics and post some that I left out before. I've got enough to fill up a CD, but I thought I might show you guys a couple that just never made it to the blog. These were the shields I was going to go with until I saw what the other guys were doing AND... the lightning bolt is backwards. Go figure, it can never be "easy" when you want to do it right. One of the boys without the blue paint on him. They look silly like this and it was hard to imagine how they would look in the end when I was painting the test model. 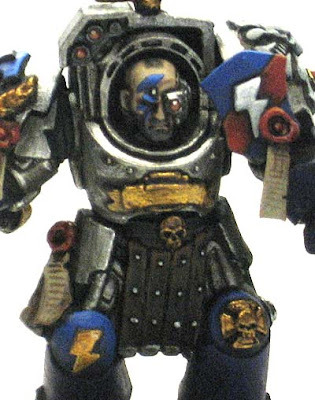 A close up of the Sergeant. My favorite of the squad. I love the way his face came out with the shaved down mowhawk, facial stubble and face paint. I was really worried about adding the face paint since the face was completely done when I went to paint it on. One mistake and I would have had to paint his entire face all over. 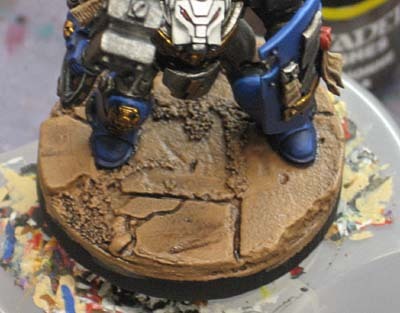 I meant to catalog how I painted the bases and got started, but never finished (the tutorial that is). And the back of the banner. See, I told you there was a scroll back there to break up the sea of blue. That's about it, most of the good stuff has already been posted. I want to thank everyone for following along and supporting the project. I thinks it great that the community can come together like this in support of a great cause like Doctors Without Borders. From the vendors who donated prize support to others who offered models and supplies for the project to everyone who simply contributed money. All of it counts and all of it matters. So if you're looking to up your chances at winning the whole army one last time, you've got until 10pm EST here on FTW. Less than 24 hours by the clock on my computer as I type this. Very nice as usual. But I have one question how did you do the scroll at the back as in what colors did you use ? Any news on the blog roll scrol feature coming back ? Well done! 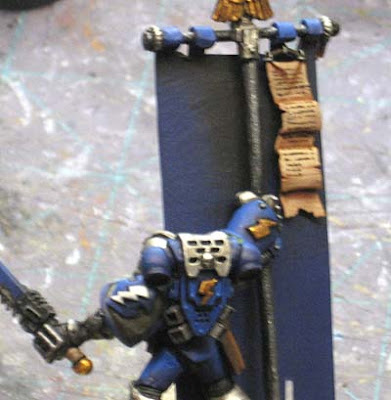 I really enjoyed the scroll on the back of the banner. I am curious about how you manufactured the shields though. I'm sure you put it up somewhere though so I'll keep looking. The scroll works great on the back of the banner too - looking great! Mjelnir: The scroll on the back is a bit that I think comes from Space Maine vehicles. It's just a larger scroll. 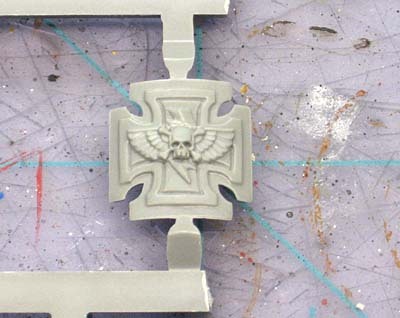 As for the colors, I use the cheaper craft paints but it starts as a light brown color, then a thin Devlan Mud wash, go over with the base color again and then add some highlights with a slightly lighter and thinned out tan color for some variety. As for the scrolling blog features... if I can find a way to keep them in the width of the sidebar, I'll add them back. That's the biggest problem right now. Playing in the Snow: I never posted anything about how I made/converted the shields even though they saw some extensive conversion work to get them like they are. 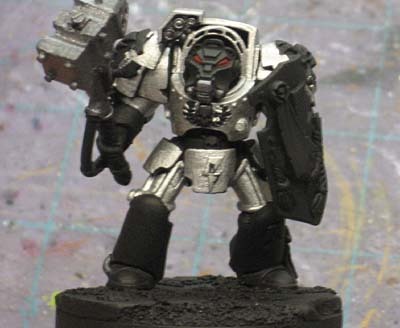 Maybe I can dig up some pics and show you all what went into converting them. That would be rather fantastic! I'm really quite new to this hobby so I'm learning as I'm going and FTW seems to have a great wealth of information to pick through. Keep it up!